In a February 26, 1942, letter to German diplomat Martin Luther, Reinhard Heydrich follows up on the Wannsee Conference by asking Luther for administrative assistance in the implementation of the "Endlösung der Judenfrage" (Final Solution of the Jewish Question). See the Transcription and translation of this letter at the Memorial House of the Wannsee Conference. The Final Solution of the Jewish Question (German: Die Endlösung der Judenfrage) refers to the Nazis' plan to engage in systematic genocide against the European Jewish population during World War II. The term was coined by Adolf Eichmann, a top Nazi official who supervised the genocidal campaign and was captured, tried and executed by Israeli authorities in 1961–62. The implementation of the Final Solution resulted in the most deadly phase of the Holocaust. The expression reflects the Nazi belief that the very existence of the Jewish European population itself posed a "question" and a problem that needed a "solution." Mass killings of over one million Jews occurred before the plans of the Final Solution were fully implemented in 1942, but it was only with the decision to eradicate the entire Jewish population that the extermination camps were built and industrialized mass slaughter of Jews began in earnest. This decision to systematically kill the Jews of Europe was made by the time of, or at the Wannsee conference, which took place in Berlin, in the Wannsee Villa on January 20, 1942. During the conference, there was a discussion held by a group of Nazi officials to decide on the "Final Solution of the Jewish Question". The records and minutes of this meeting were found intact by the Allies at the end of the war and served as valuable evidence during the Nuremberg Trials. By spring of 1942, Operation Reinhard began the systematic extermination of the Jews, although hundreds of thousands already had been killed by death squads and in mass pogroms. In Heinrich Himmler's speech at the Posen Conference of October 6, 1943, Himmler, for the first time, clearly elucidated to all assembled leaders of the Reich, in frank and brutal terms, what the "Final Solution" actually entailed. The "Final Solution" is a euphemistic term that was intended to veil the commission of unspeakable acts of genocide. There is still considerable debate among historians about when, exactly, the decision to eradicate the Jewish population of Europe was made by the Nazi leadership. The consensus is that the outlines of the Final Solution arose gradually throughout the summer and fall of 1941. Prominent Holocaust historian Christopher Browning has stated that the decision to exterminate the Jews was actually two decisions, one in July 1941 to kill the Jews of Russia (mass killings by the Einsatzgruppen had already begun by the summer of 1941), the second in October 1941 to exterminate the remaining Jews of Europe. 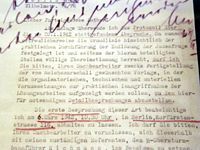 There is ample evidence for this view, for example on July 31, 1941, under instructions from Adolf Hitler, Nazi official Hermann Göring ordered SS general Reinhard Heydrich to "submit to me as soon as possible a general plan of the administrative material and financial measures necessary for carrying out the desired final solution of the Jewish question." Regarding the Jewish question, the Führer is determined to clear the table. He warned the Jews that if they were to cause another world war, it would lead to their own destruction. Those were not empty words. Now the world war has come. The destruction of the Jews must be its necessary consequence. We cannot be sentimental about it. It is not for us to feel sympathy for the Jews. We should have sympathy rather with our own German people. If the German people have to sacrifice 160,000 victims in yet another campaign in the east, then those responsible for this bloody conflict will have to pay for it with their lives. As for the Jews, well, I can tell you quite frankly that one way or another we have to put an end to them. The Führer once put it this way: if the combined forces of Judaism should again succeed in unleashing a world war, that would mean the end of the Jews in Europe.... I urge you: Stand together with me... on this idea at least: Save your sympathy for the German people alone. Don't waste it on anyone else in the world... I would therefore be guided by the basic expectation that they are going to disappear. They have to be gotten rid of. At present I am involved in discussions aimed at having them moved away to the east. In January there is going to be an important meeting in Berlin to discuss this question. I am going to send State Secretary Dr. Buhler to this meeting. It is scheduled to take place in the offices of the RSHA in the presence of Obergruppenführer Heydrich. Whatever its outcome, a great Jewish emigration will commence. But what is going to happen to these Jews? Do you imagine there will be settlement villages for them in the Ostland? In Berlin we were told: Why are you making all this trouble for us? There is nothing we can do with them here in the Ostland or in the Reich Commissariat. Liquidate them yourselves!.... Here are 3.5 million Jews that we can't shoot, we can't poison. But there are some things we can do, and one way or another these measures will successfully lead to a liquidation. They are related to the measures under discussion with the Reich.... Where and how this will all take place will be a matter for offices that we will have to establish and operate here. I will report to you on their operation at the appropriate time. The evacuation of European Jewry to the island of Madagascar was not a new concept. Henry Hamilton Beamish, Arnold Leese, Lord Moyne, and governments including the British, French, and Polish, had all contemplated the idea, as did the German scholar Paul de Lagarde. Nazi Germany seized upon it, and in May 1940, in his Reflections on the Treatment of Peoples of Alien Races in the East, Heinrich Himmler declared: "I hope that the concept of Jews will be completely extinguished through the possibility of a large emigration of all Jews to Africa or some other colony." Although some discussion of this plan had been brought forward from 1938 by other well-known Nazi ideologues, such as Julius Streicher, Hermann Göring, and Joachim von Ribbentrop, it was not until June 1940 that the plan was actually set in motion. With victory in France imminent, it was clear that all French colonies would soon come under German control, and the Madagascar Plan could become reality. It was also felt that a potential peace treaty with Great Britain, which in a few weeks' time was about to experience German aerial bombardment in the Battle of Britain and whom the Germans fully expected to capitulate as quickly as the French, would put the British navy at Germany's disposal for use in the evacuation. An ambitious bureaucrat named Franz Rademacher, recently appointed leader of the Judenreferat III der Abteilung Deutschland, or Jewish Department of the Ministry of Foreign Affairs, set the plan in motion on June 3, 1940, with a memorandum to his superior Martin Luther. The memorandum included a definition of the mechanics of Jewish evacuation out of Europe. Rademacher espoused the division of eastern and western Jews. The eastern Jews, he felt, were the source of the "militant Jewish intelligentsia," and should be kept close at hand in Lublin, Poland, to be used as a kind of hostage to keep American Jews in check. The western Jews, he went on, should be removed from Europe entirely, "to Madagascar, for example." On receiving the June 3rd memorandum, Luther broached the subject with Foreign Minister Ribbentrop. By June 18, Hitler himself, as well as Ribbentrop, spoke of the Plan with Mussolini in reference to the fate of France after its defeat. On June 20, Hitler spoke directly of the Madagascar Plan with Grand Admiral Erich Raeder. Once learning of the new potential of the Plan, Reinhard Heydrich, appointed in 1939 by Göring to oversee Jewish evacuation from German-occupied territory, had Ribbentrop relinquish any future actions to the RSHA (Reich Central Security Office). In this way, Adolf Eichmann, who headed the office of Jewish evacuation in the RSHA, became involved. On August 15, Eichmann released a draft titled Reichssicherheitshauptamt: Madagaskar Projekt, calling for the resettlement of one million Jews per year over four years, and abandoning the idea of retaining any Jews in Europe whatsoever. The RSHA, he emphasized, would control all aspects of the program. Most Nazi officials, especially the authorities of the General Government including Hans Frank, viewed the forced resettlement of four million Jews to Madagascar as being infinitely more desirable than the heretofore piecemeal efforts at deportation into Poland. As of July 10, all such deportations were cancelled, and construction of the Warsaw ghetto was halted, since it appeared to be unnecessary. Rademacher envisioned the founding of a European bank that would ultimately liquidate all European Jewish assets in order to pay for the Plan. This bank would then play an intermediary role between Madagascar and the rest of Europe, as Jews would not be allowed to interact financially with outsiders. Göring's office of the Four Year Plan would oversee the administration of the Plan's economics. Additionally, Rademacher foresaw roles for other government agencies. Ribbentrop's Foreign Affairs Ministry would negotiate the French peace treaty that would result in the handing over of Madagascar to Germany. It would also play a part in crafting other treaties to deal with Europe's Jews. Its Information Department, along with Josef Goebbels in the Propaganda Ministry, would control information at home and abroad regarding the policy. Victor Brack of the Führer Chancellory would oversee transportation. The SS would carry on the Jewish expulsion in Europe, and ultimately govern the island in a police state. The Germans' desired perception from the outside world would be that Germany had given "autonomy" to the Jewish settlement in Madagascar. However, Eichmann made it plain in his draft that the SS would control and oversee every Jewish organization that was created to govern the island. In late August 1940, Rademacher entreated Ribbentrop to hold a meeting at his Ministry to begin drawing up a panel of experts to consolidate the Plan. Ribbentrop never responded. Likewise, Eichmann's draft languished with Heydrich, who never approved it. The Warsaw ghetto was completed and opened in October. Expulsions of Jews from German territory into Poland continued again from late autumn 1940 to spring 1941. The resistance of Great Britain during the Battle of Britain, and Germany's failure to achieve a quick victory by September were the ultimate causes of the Plan's collapse. The British fleet would not be at Germany's disposal to be used in evacuations; the war would continue indefinitely. Mention of Madagascar as a "super ghetto" was made once in a while in the ensuing months, but by early December, the Plan was abandoned entirely. When the British and Free French forces took over Madagascar from Vichy forces in 1942, this effectively ended all talk of the Plan. The failure of the Madagascar Plan, and the eventual logistical problems of deportation in general, would ultimately lead to the conception of the Holocaust as the "Final Solution of the Jewish Question." By November 1, 1941, the first extermination camps were being built: first Belzec, then Sobibor, Treblinka, Chełmno extermination camp and Majdanek, and finally Auschwitz-Birkenau. The mass execution of Jews began in early 1942. ↑ Gord McFee, When did Hitler decide on the Final Solution? The Holocaust History project. Retrieved March 15, 2008. ↑ Christopher R. Browning, The Origins of the Final Solution (2004), 81. Gerlach, Christian. The Wannsee Conference, the Fate of German Jews, and Hitler's decision in principle to exterminate all European Jews, The Journal of Modern History. Chicago: Dec 1998. Vol.70, Iss. 4, pg. 759. This page was last modified on 10 April 2017, at 18:00.